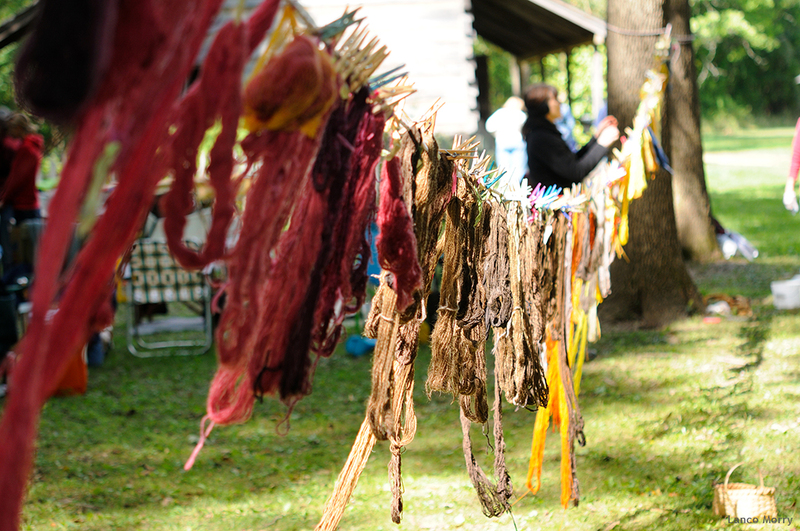 The local fiber club, CU Spinners & Weavers Guild, held a natural dye day at Forest Glen Forest Preserve in Vermilion County, Illinois in September. Sarah and I had never been to anything of the sort. Two of her aunts were going so we tagged along for the day. The attendees were a familiarity to those within a niche interest group full of passionate people. Being a fishhead, I can relate when fellow fish folk all get together. It put a smile on my face. 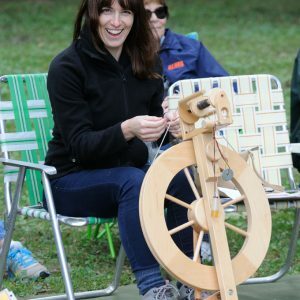 There were spinning wheels, lots of yarn, and a large fire. 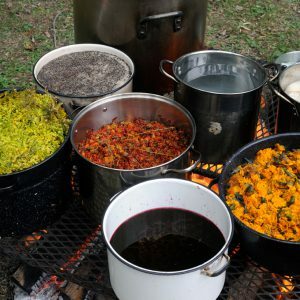 This fire had a steel rack over it and a series of pots all stuffed to the brim with colored material of some kind – goldenrod florets for yellow, Marigold flowers for orange, ect. The largest of pots contained the rotten husks of Walnuts for an earthy olivaceous brown. 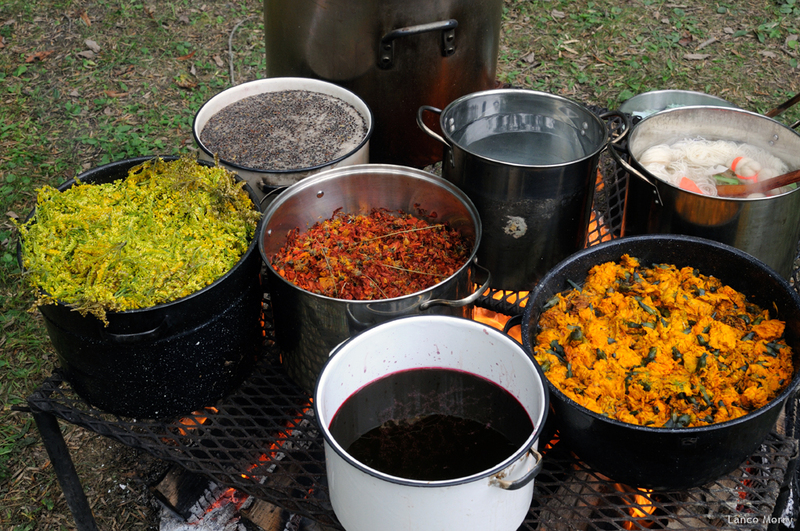 After a hefty boil, plant material is strained and yarn bundles are submerged to soak. They are then hung to dry. Getting a blue coloration with Indigo proved to be a bit different. The simmering pot has a yellow/green appearance. Dyed fabric has a similar coloration once pulled from the steep. Oxidation of indigo by exposure to air slowly turns drying fabrics from a yellow/green to a deep blue as they begin to dry. 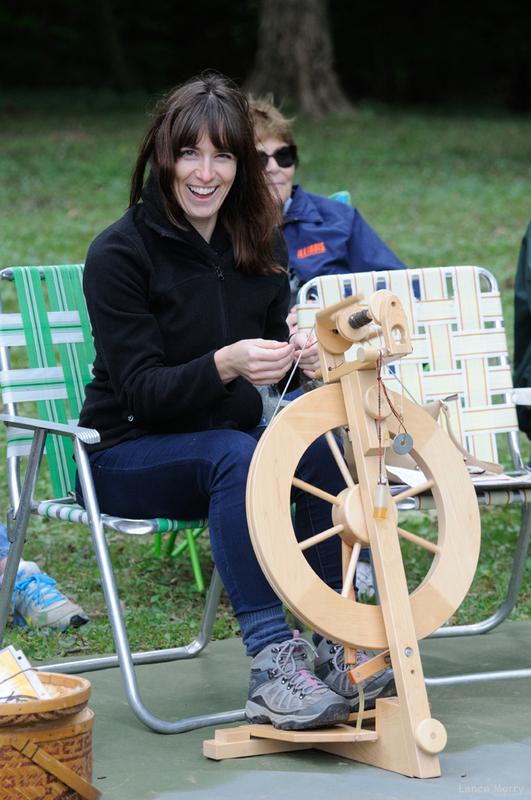 Sarah enjoying a spinning wheel. Part of the afternoon, I wondered off in search of Hen of the Woods mushrooms that I had seen at bases of several trees the previous autumn. Once a host tree is discovered, with the right conditions, these delicious edibles can be found there year after year. 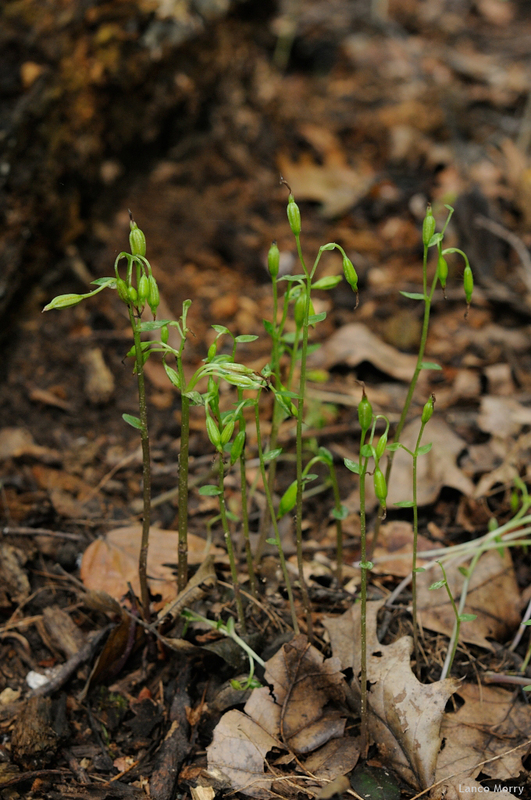 In route I saw Yellow Lady’s Slippers in seed and what appeared from a casual glance to be clumps of Autumn Coralroot in seed. As I continued walking, the realization hit me that those coralroots shouldn’t be that far along yet. I backtracked. On my hands and knees I said “Is that three birds?” Three Birds Orchid is one I had not seen before. Given its’ quirky flowering time and shady distribution across Central Illinois, I assumed I would never see this plant. Albeit not in flower, there it is, and several clumps at that. With the information available online, this appeared to be a new county level record. After going through a plant inventory the Vermilion County Conservation District had, I discovered Paul Shildneck had found this species within the same patch of forest in the 70’s. Of course he would! With all the unexpected excitement, I ended up not even making it to where I found Hen of the Woods the previous year.